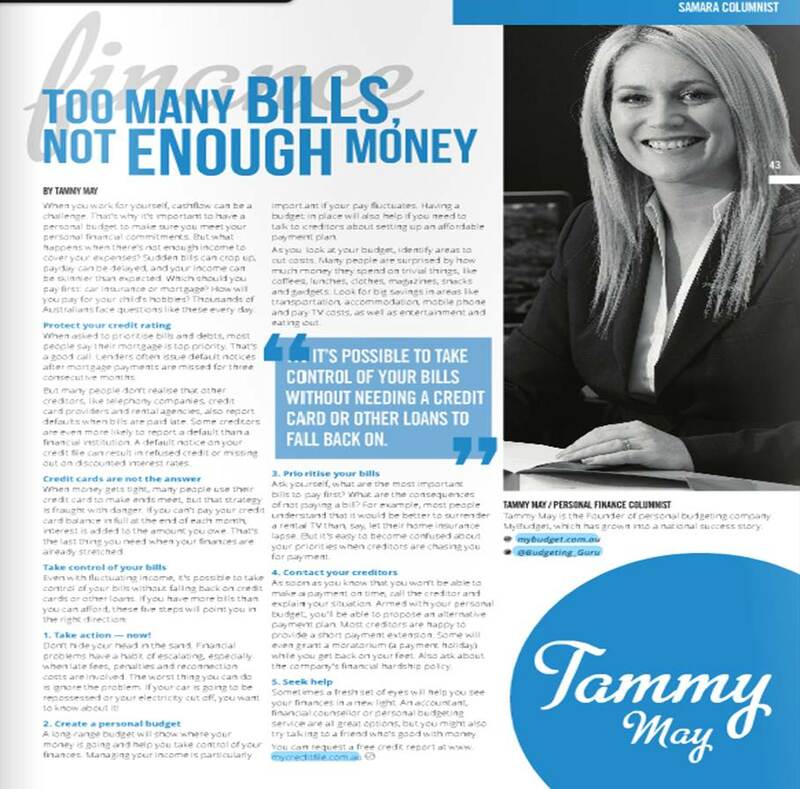 This article appears in issue 3 of Samara Magazine, a free online magazine for women business owners and entrepreneurs. Helping people to succeed and achieve their life goals is very important to me. The advice outlined in this article--what to do when there are more bills than income--applies as much to people in paid employment as to those running their own business. Good money management always comes back to budgeting. When you work for yourself, cash flow can be a real challenge, that’s why it’s important to have a personal budget to make sure you meet your personal financial commitments. But what happens when there’s not enough income to cover your expenses? Sudden bills can crop up, payday can be delayed or your income can be skinnier than expected. Which should you pay first: your car insurance or mortgage? How will you pay for your child’s hobbies? Thousands of Australians face questions like these every day. When asked to prioritise their bills and debts, most people say that their mortgage is their top priority. That’s a good call. Lenders often issue default notices after mortgage payments have been missed for three consecutive months. But many people don’t realise that other creditors (telephone companies, credit card providers, rental agencies etc.) also report defaults when bills are paid late. In fact, some creditors are more likely to report a default than a financial institution. You want to avoid default notices on your credit file—they can result in you being refused credit or missing out on discounted interest rates. When money gets tight, the solution for many people is to use their credit card to make ends meet, but that strategy is fraught with danger. If you can’t pay your credit card balance in full at the end of each month, interest will be added to the amount you owe—the last thing you need when your finances are already stretched. Even with fluctuating income, it’s possible to take control of your bills without needing a credit card or other loans to fall back on. 1. Take action — now! Don’t hide your head in the sand. Financial problems have a habit of escalating, especially when late fees, penalties and reconnection costs are involved. The worst thing you can do is ignore the problem. If your car is going to be repossessed or your electricity cut off, you want to know about it! A long-range budget will show you where your money is going and help you take control of your finances. Managing your income is particularly important if your income fluctuates. Having a budget in place will also assist you if you need to talk to your creditors about setting up an affordable payment plan. As you look at your budget, identify areas to cut costs. Many people are surprised by how much money they spend on unnecessary things (coffee, lunches, clothes, magazines, snacks, and gadgets etc.) Look for big savings in areas like transportation, accommodation, mobile telephone, pay TV, entertainment and eating out. Ask yourself, what are the most important bills to pay first? What are the consequences of not paying a bill? For instance, most people understand that it’s better to surrender a rental TV than, say, let their home insurance lapse. But it’s easy to become confused about your priorities when creditors are chasing you for payment. As soon as you know that you won’t be able to make a payment on time, call the creditor and explain your situation. Armed with your personal budget, you’ll be able to propose an alternative payment plan. Most creditors are happy to provide a short payment extension. Some will even grant you a moratorium (a payment holiday) while you get back on your feet. Also ask about the company’s financial hardship policy. Sometimes a fresh set of eyes will help you to see your finances from a new perspective. An accountant, financial counselor or personal budgeting service are great options, but you might also try talking to a friend who’s good with money.